British Prime Minister Theresa May says she asked the European Union on Wednesday to delay the country's divorce from the bloc until June 30, but the EU's chief said approval comes with a condition. 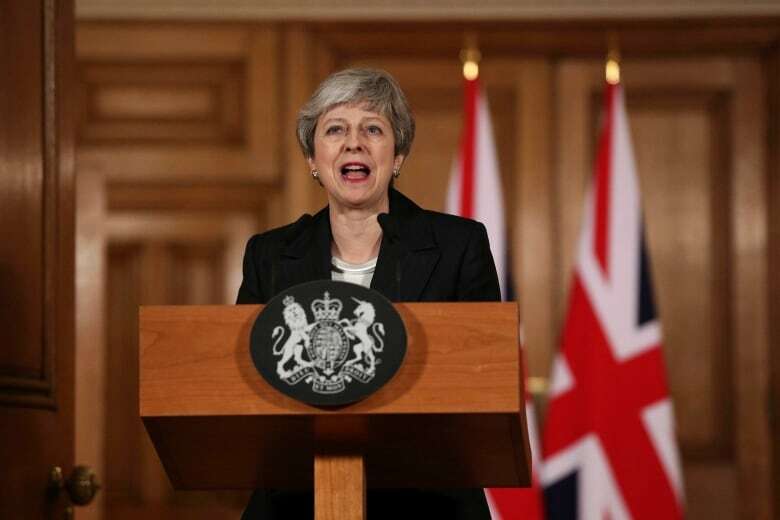 British Prime Minister Theresa May says she asked the European Union on Wednesday to delay the country's divorce from the bloc until June 30. "As prime minister, I am not prepared to delay Brexit any further than the 30th of June," May told a rowdy session of Parliament. "I have therefore this morning written to [European Council] president [Donald] Tusk, the president of the European Council, informing him that the U.K. seeks an extension to the Article 50 period until the 30th June," she said. "The government intends to bring forward proposals for a third meaningful vote. If that vote is passed, the extension will give the House [of Commons] time to consider the Withdrawal Agreement Bill. If not, the House will have to decide how to proceed." In response, Tusk gave a tentative greenlight to Britain's request to delay Brexit — but said EU approval comes with a condition. Tusk said Wednesday "that a short extension will be possible, but it will be conditional on a positive vote" in British Parliament on the Brexit agreement May reached with the EU. 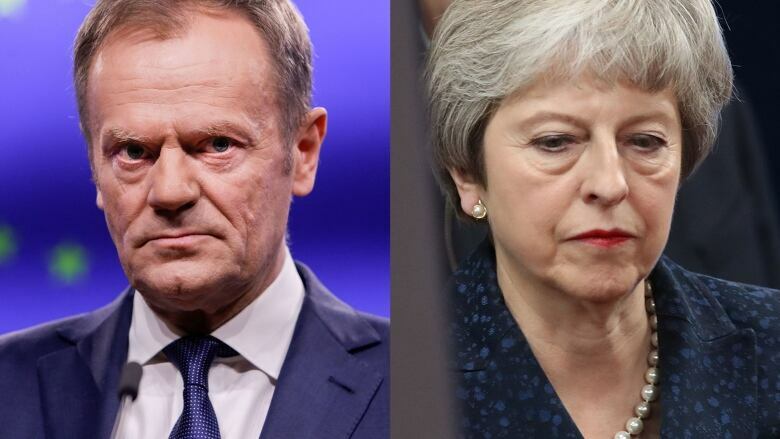 Tusk says May's petition for a withdrawal date of June 30 instead of March 29 poses legal and political issues since elections for the EU Parliament are being held May 23-26. In an address to the public later from 10 Downing Street, May called the delay "a matter of great personal regret," and said she is absolutely sure the public has had enough of the infighting and political games. "It is now time for MPs to decide," she said. "So far, Parliament has done everything possible to avoid making a choice... All MPs have been willing to say is what they do not want. I passionately hope MPs will find a way to back the deal I have negotiated with the EU." May's announcement prompted an uproar in Parliament, where the Labour Party accused her of "blackmail, bullying and bribery" in her attempts to push her deal through, and one prominent pro-Brexit supporter in her own Conservative Party said seeking a delay was "betraying the British people." But a long extension would infuriate the pro-Brexit wing of May's divided party and require Britain to participate in the late May election for the European Parliament. May said that would be unacceptable, adding a longer delay would result in Parliament spending "endless hours contemplating its navel on Brexit." British lawmakers have twice rejected the Brexit deal May has struck with the bloc. Her troubles deepened when the Speaker of the House of Commons ruled earlier this week that she can't ask Parliament to vote on the deal again unless it is substantially changed. That scuttled May's plan to try a third time to get the agreement approved. A delay to Britain's withdrawal requires the approval of all 27 remaining EU countries, and France said the EU would not automatically grant it. "France's position is simple: the British prime minister must explain to us for how long and what for, and offer us guarantees," French government spokesperson Benjamin Griveaux told reporters. "A delay is therefore not automatic nor certain," he said. Griveaux said the issue had not been discussed in a cabinet meeting that was taking place when May published her letter requesting the delay. Conversely, German Chancellor Angela Merkel's spokesperson is welcoming the fact Britain has finally made a "clear request" about how to proceed on Brexit, but isn't saying how Germany will respond. "We welcome the fact that there is now a clear request from Britain," SteffenSeibert, Merkel's spokesperson, told reporters in Berlin. Juncker, the head of the bloc's executive branch said EU leaders are unlikely to agree to a delay at a summit this week. Juncker said if May wants a delay, "she must bring approval of the negotiated deal and she must bring clear ideas on timing." Juncker said "in all probability" Britain won't leave on March 29, but he underlined the EU's insistence that it will not reopen the painstakingly negotiated withdrawal agreement that British lawmakers have snubbed. Juncker said Parliament needed to decide whether it would approve the deal that is on the table.